After a user completes the first page of a form that requires login, the information for that user access is used to create an incomplete receipt. Information is recorded as the user submits form pages. If the user abandons the form before completion the user will be able to re-access that form in order to complete their submission. Click the Receipts link under the form you wish to view receipts for. 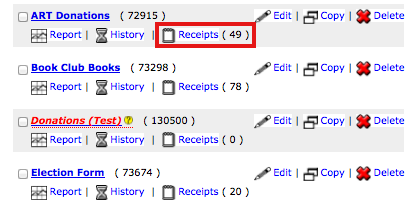 Select Incomplete Receipts from the dropdown at the top of the page. Here you'll see a list of incomplete receipts submitted through this form. Beginning of the form - users will have to fill out the entire form from the beginning when the form is re-accessed. The page at which the form was abandoned - then users will have the option to continue starting with the first page they did not complete. When a user with an incomplete receipt logs into a form they will be presented with the option to continue filling out the form based on the selected Receipt Management Settings or start over from the beginning.